“What makes this incredible and groundbreaking is that in January of 2015, the Veterans Administration has finally implied — after many years of attempting to get them to acknowledge that John Burroughs was injured while in the Rendlesham Forest, tying it together with the Condign document from the U. K. — it was an unidentified aerial phenomenon or vehicle that caused the injury (to John Burroughs). February 27, 2015 Albuquerque, New Mexico - On Saturday night, February 21, 2015, retired USAF Tech Sgt. John Burroughs received the Researcher of the Year Award at the Open Minds International UFO Congress in Fountain Hills, Arizona. The award honored John's breakthrough by using Freedom of Information requests to the U. K.'s Ministry of Defence that finally provoked MoD admission that it was withholding 18 classified files, including 6 policy files, about the RAF Bentwaters/Woodbridge Rendlesham Forest events December 26-28, 1980, that involved Unidentified Aerial Phenomena (UAP) that interacted with John Burroughs, then USAF Airman 1st Class. 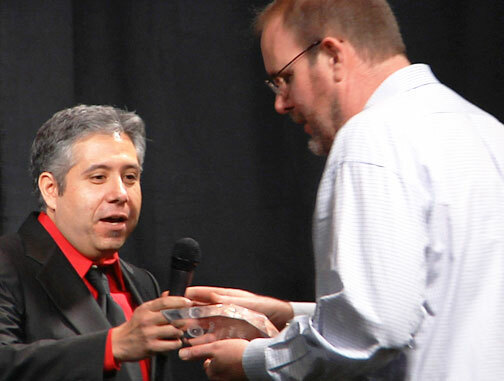 John Burroughs receiving Researcher of the Year Award 2015, from Alejandro Rojas, Director of Operations, 2015 Open Minds International UFO Congress, on Saturday, February 21, 2015, Fountain Hills, Arizona. Image © 2015 by Open Minds. See Open Minds video about John Burroughs below in More Information.